Watch bird antics up close with the Coveside In-House Breadbox Window Bird Feeder. The bold shape of this feeder mimics a traditional breadbox, with a rounded front panel made of plastic. This transparent section allows you to observe the birds while they feed, for a clear view of avian activity. A flattened back section aligns with your window or sill for even placement. The wide, mahogany feeding platform can accommodate up to 2 quarts of seed, or offer fruit or suet for more diverse feeding. The open design allows several birds to dine at once, and a wooden disc at the top of the item enables you to refill it easily. The unit rests inside a double hung window from 24" to 36" wide, or for versatility, can be placed on the window channels. 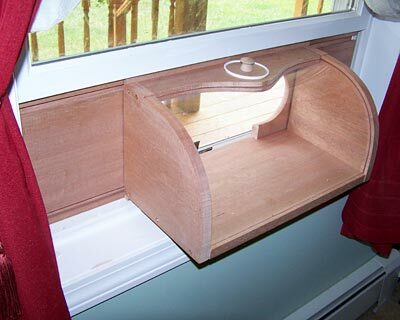 Two included wooden side panels attach to the feeder, creating a barrier between your window and the elements, and included insulation strips and Velcro sections keep the item fully in place. The frame of this sturdy feeder is crafted from mahogany, for durability and elegance. Enjoy birding activity in your home with this In-House Breadbox Window Bird Feeder. Some assembly required. Made in the USA.